Can you confirm these amateur observations of Proctoporus sucullucu? Distribution Peru (Cusco, Apurimac), elevation 3000-3300 m.
W), a small village near the town of Chilca, Province of Urubamba, Department of Cusco, Peru; 3191 m elevation. Diagnosis Diagnosis. (1) Nasal divided, forming a pentagonal loreal scale, (2) median occipital present, (3) superciliaries four, first expanded onto dorsal surface of head, (4) palpebral eye-disc made up of a single, undivided, pigmented scale, (5) supralabials six, (6) infralabials five, (7) genials two, (8) dorsal scales quadrangular, with rounded keel, (9) transverse rows of dorsals 38–46, (10) transverse ventral rows 24– 25, (11) a continuous series of small lateral scales separating dorsals and ventrals, (12) femoral pores per hind limb in males 6–8, in females 0–3, (13) preanal pores absent, (14) limbs overlapping when adpressed against the body, (15) ventral scales with grey stippling. Proctoporus sucullucu is a member of the P. pachyurus group (Uzzell, 1970), which is united by the synapomorphy of the presence of an undivided palpebral disc. Proctoporus sucullucu can be distinguished by this charac-ter from all other Proctoporus species except those of the P. pachyurus group. Proctoporus sucullucu can be distinguished from P. boli-vianus by having six supralabials (P. bolivianus has four or five). 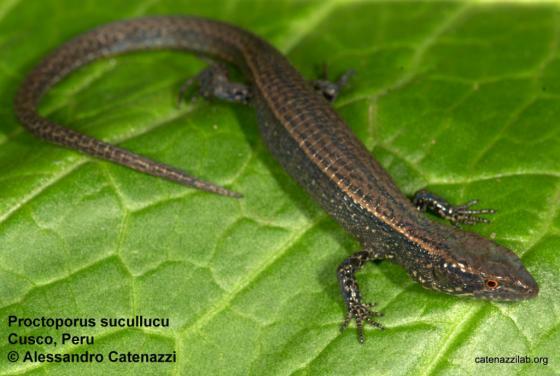 It can be distinguished from P. guentheri by a higher number of transverse dorsal scale rows (29–36 in P. guentheri; 38–46 in P. sucullucu). 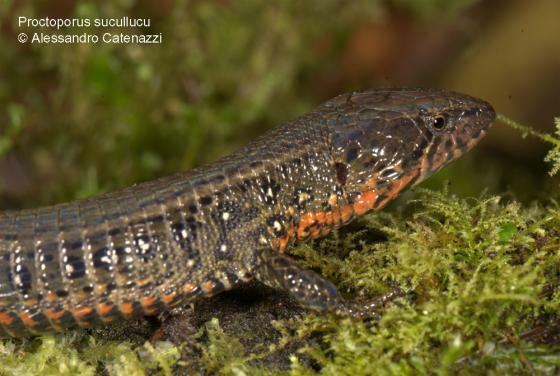 It can be distinguished from P. pachyurus by having fewer transverse dorsal scale rows (47–61 in P. pachyurus; 38–46 in P. sucullucu). It can be distinguished from P. unsaacae by limbs overlapping when ad-pressed (from DOAN & CASTOE 2003). 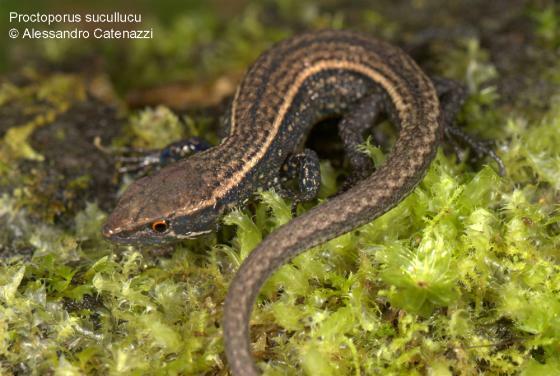 Etymology Named after the name of Proctoporus lizards in the local Quechua language.